Ashlee Arceneaux, owner of Small Chalk out of New Orleans, designed the murals housed in the Legacy Cafe, as well as its logo. 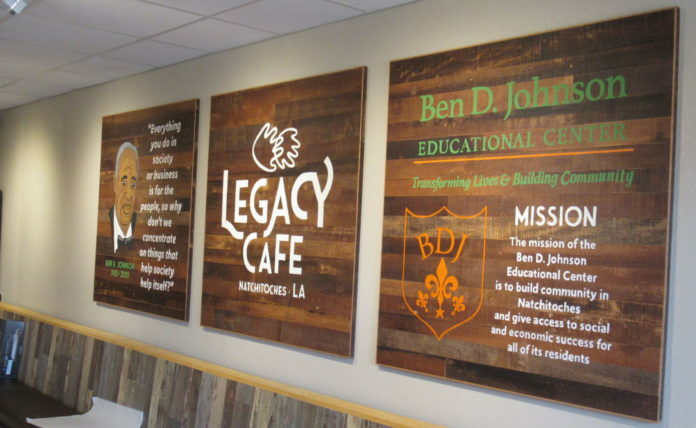 The Ben D. Johnson Educational Center is celebrating the opening the Legacy Café with two upcoming events: a ribbon cutting Friday, Jan. 18 from 11 a.m. to 1 p.m. and the Legacy Lunch Monday, Jan. 21 from noon to 3 p.m. The Legacy Café is a component of the nonprofit organization, Ben D. Johnson Educational Center. The Ben D. Johnson Educational Center will utilize a social enterprise structure to serve the community with a youth workforce development program, Legacy Café, teaching farm and green market and a shared community kitchen/business incubator. The Legacy Café, located at 400 MLK Drive, Suite J, will offer a made from scratch menu with locally sourced ingredients when available. Breakfast will include quiche, muffins, scones and specialty coffee drinks. Lunch will offer soups, salads and sandwiches. Café hours will be Monday – Friday from 7 a.m. to 2 p.m. The café will be the hands-on training environment for participants in the Legacy Youth Workforce Development Program. The ceremonial ribbon cutting will take place between 11 a.m. and 1 p.m. with the Natchitoches Area Chamber of Commerce. Cookies and coffee refreshments will be provided with the lunch menu available for purchase. The Legacy Lunch will be an annual fundraising event on Martin Luther King, Jr. Day. The set menu of red beans and rice, cracklin’ cornbread, dessert and water, is available to purchase for $10. All funds raised for the lunch as well as at the Café support the programs of the Ben D. Johnson Educational Center. “We are excited to offer the community a fresh menu while providing an opportunity for young people to gain life, job and occupational skills,” said Claire Prymus, founder and Board Chair. The mission of Ben D. Johnson Educational Center is to build community in Natchitoches and give access to social and economic success for all of its residents. Founded by Prymus in honor of her late uncle, the Ben D. Johnson Educational Center is a 501(c)3 nonprofit organization with a commitment to building community and providing access and opportunities for residents in Natchitoches.